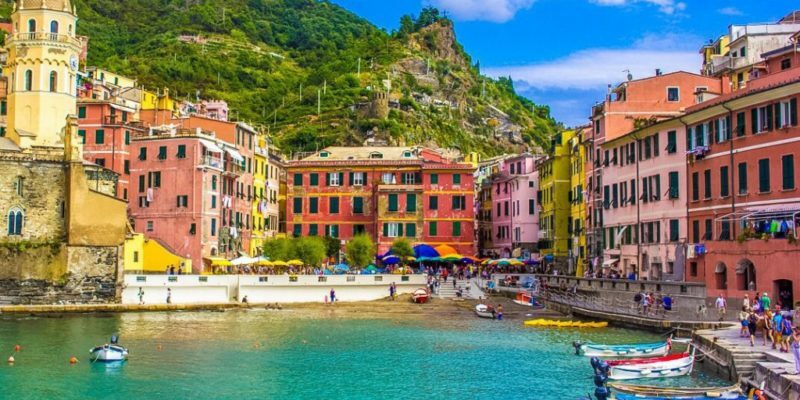 A trip from Riomaggiore to Monterosso to finish in Portovenere in the beautiful scenery of the Ligurian Cinque Terre is a very special experience. An authentic immersion into the magic of historic and colorful villages in spectacular seaside location, overlooking the hills, the steep terrain where triumph the vineyards and where the sea is near perfectly with agriculture in a unique fragrance with spectacular aromas. A wonderful course then in the localities of the protected National Park of Cinque Terre, declared World Heritage by UNESCO in 1997. The itinerary begins in Riomaggiore, the first of the Cinque Terre coming from south or from Tuscany. We have some first news of Riomaggiore only in 1251, when the inhabitants of the district of Carpena, spread coast, swore faith to the Republic of Genova. Between 1200 and 1300 the inhabitants of these settlements decided to go down towards the sea and give life to the village. San Giovanni Battista (St. Giovanni Baptist). The Church is located up on the village, erected in 1340 with those central ones double with respect to the side ones (as all the other churches of the Cinque Terre). Riomaggiore Castle also called “Castellazzo di Cerrico” erected on 1260 has built as a rectangle with the mayor lines directly on the see. Actually, castle is a cemetery which dominates the historical centre. L’Oratorio di Santa Maria Assunta (Oratory of St. Mary Assumption) which holds a Trittico XV century and a wooden statue of 1300 representing the Madonna (Maria). Also important is the Castello (castle) which dominates the historical centre. Riomaggiore beach is located at the east of the village. After the station tunnel, you go down to the harbor and then take on the left, near docks ferry Cinque Terre. Following the only road beside the cliff leads to a rocky beach. The beach is quite large and very impressive. It is equipped with showers, but has no security services and the bad seas may be danger to swim, especially for the large stones that are found on the shore. Another beautiful beach, unreachable by walk but for the bad conditions of path but just by boat, is the Canneto beach between Punta Castagna and Punta del Cable. Here distinction is of having a natural wall of fresh water coming down the hill as a natural shower. Large Impact also the enormous black rock overlooking the sea which rises Manarola, known for its wine and oil production, with His case colored typical of the Genovese style which seems exit from rock. The church dedicated to the Nativity of the Virgin Mary or San Lorenzo, more commonly “The Church of San Lorenzo”, was built in 1338, work of the inhabitants of Manarola and Volastra, as reviewed the stone on the façade of the church. Also important is the bell tower, detached from the main body of the church, probably because originally it held a defensive role. Between Riomaggiore and Manarola there is One of the paths more romantic and celebrated in the world: Via Dell’Amore (or roughly “Street of the loving”). The way, just paved path, beside the rocks, overlooking the sea, is easy to walk for any age. This trail has been closed since rock slide injured several tourists in 2012. Only the side starting from Manarola is open for a short distance and is wheelchair accessible. Not far away, a hundred meters in altitude from the sea about, Corniglia, is a village perched on the promontory ridge and connected to the beach by 365 steps. From this country, where tradition mainly linked in wine crops you can enjoy a splendid view. Corniglia, the only village of the Cinque Terre not in contact with the sea, rising on top of a rock promontory. The street of largo Taragio, is the main square of Corniglia and real pulsating heart of the village. the Church of San Pietro (St. Peter), built in 1334. It has a Baroque style, with some Gothic and Ligurian elements. In 1351 the façade of the church, is renovated with many decoration as Carrara white marble rosette window which a bas-relief which shows a deer, the emblem of the village. 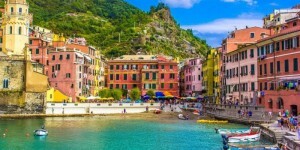 It will arrive in Vernazza, with its charming marina, around which develops the medieval town. We have the first documents to Vernazza in 1080, It’s Considered by many people the most charming village of Cinque Terre. The remarkable economic and social level reached by the village in Medieval times and still today testified by the town planning conformation and by the presence of architectural elements of great importance, like lodges, churches, “casetorri” and arcades. It is distinguished by the characteristic square, two imposing towers of the Genoese sighting that were used to defend against pirate attacks and the charming church Saint Margaret of Antioch. Santa Margherita di Antiochia (St. Margaret of Antioch), a Roman-Genovese style church in two floors which are recognised a Medieval body and a Renaissance one. 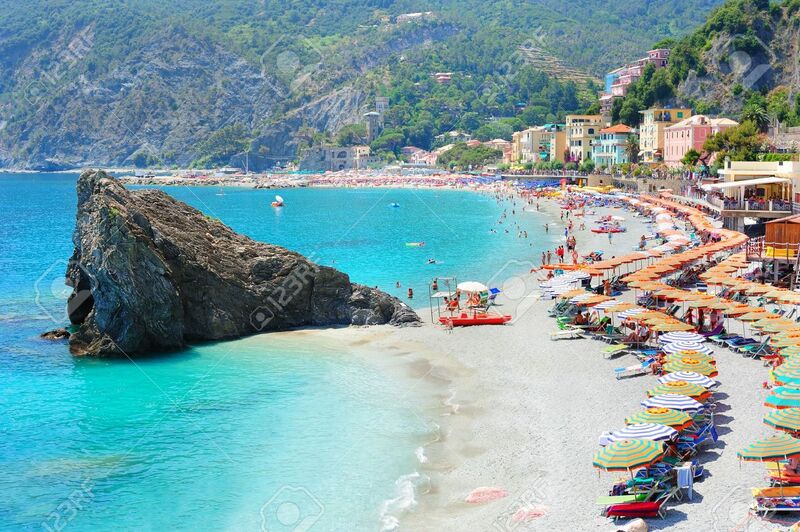 Monterosso al Mare, called also Monterosso is the most famous village of Cinque Terre and also the largest it. Has been the first to be documented in 1056, Actually is divides in two side, the old village and the new one called Fegina. In the old village, there are narrow streets go up on the colle dei Cappuccini (Cappuccini’s hills) where it’s possible to admire the church of San Giovanni Battista (St. John the Baptist) in front of which rose the Medieval Palazzo del Podestà, of which some traces remain. In Fegina, the new village, there is one of the best beaches in Italy and also in the word as mentioned in “Forbes Traveller’s list of 25 sexiest beaches”. In this side of village there is also the literary Park dedicated to the poet Eugenio Montale, Italy poet of these lands. The church of San Giovanni Battista was built between 1200 and 1300 in Gothic style. The beautiful facade is decorated with white and green marble The bell tower crowned by merlons was at the begin a medieval defensive tower with a rectangular plant in green stone. The Cinque Terre have been UNESCO Word Heritage from 1997 and then become a part of a National Park since 1999. An institute, the only one in Italy with the purpose of protecting the landscape in which man has created a stable life and of reciprocal cohabitation between himself and nature. After leaving the protected Natural Park of Cinque Terre, it is definitely worth a stop to Portovenere. This feature and the popular resort of Liguria is a perfect example of the blend of nature and architecture: from the promenade that frames the marina to the infinite range of colors of its narrow houses, with steep stairs and narrow lanes by the end of the promontory of Bouches where stands the church of San Pietro, the early Christian was built in the Gothic style. Also worth seeing is the Sanctuary of the Madonna Bianca, once the parish church of San Lorenzo, built in the twelfth century in Romanesque style and later renovated and expanded, and the Doria Castle, the majestic military fortress. In front of Portovenere are the three islands of Palmaria (a destination for boat trips, where you visit the Grotta Blue), Tino and Tinetto. A coast of many colors, evocative and unique. Villages overlooking the sea, green hills and clear water. The Gulf of La Spezia can be discovered easily and it is not surprising that this land was greatly loved by poets and writers such as Shelley, Byron, Petrarca and Montale. From them it took its name from the Gulf of Poets, which stretches from Lerici to Portovenere embracing between two headlands beaches, rugged coastline, blue sea, ancient villages and wild nature. By boat: this is the best way to visit the spectacular coast of Five Villages. With great days you can show the splendid view from the boat and also have relax from the top of the boats. Cinque Terre are served by a service of boats that dock in the park all villages, except Corniglia because the bottom does not allow docking and disembarkation of passengers. This is also the most expensive way because tickets cost 32 Euro for an all day pass. On walk: Walking is very popular in Cinque Terre. Hiking paths are subject to a fee pass, especially on the main coastal paths. If you don’t want pay it you can use up hills path just outside the National Park. Note: Currently the paths between Riomaggiore and Manarola called also the “via dell’Amore” “the path of love”, as well as Manarola to Corniglia are closed because of the risk of landslides. By car: cars is the worst way to visit Cinque terre. Connections between villages by roads are very narrow and stipy. And sometimes are partially closed. Also many times, the two way road is large just for one car so you need to go back and leave pass the other cars. Also parking are very small and expensive and also sometimes very far from the village. If you have just a day to visit cinque terre we advise you to visit by guide or tour guide wich can help you and leading you in this special place instead have a stressfull day for parking, tickets and boat/train timetables.